The sun rises over Prague and Prague Castle, left, Thursday, April 8, 2010. U.S. President Barack Obama is to sign a new arms reduction treaty with his Russian counterpart Dmitry Medvedev at Prague Castle today. A statue of a crucified man at Charles bridge is pictured to the left of Prague’s castle on April 7, 2010. Russian President Dmitry Medvedev landed in Prague Wednesday evening to sign a landmark nuclear disarmament treaty with US President Barack Obama the following day, a Prague airport spokeswoman said. The two heads of state will sign a successor to the 1991 Strategic Arms Reduction Treaty (START), which expired last December, in the city where Obama called for a nuclear-free world in a keynote speech a year ago. The sun sets behind towers of Prague’s castle on April 7, 2010. The US and Russian presidents will meet in Prague on Paril 8, 2010 to sign a landmark nuclear disarmament treaty a year after the Barack Obama called for a nuclear-free world in the historic Czech capital. After months of difficult negotiations between the two nuclear powers, Obama and Dmitry Medvedev are due to sign a successor to the 1991 Strategic Arms Reduction Treaty (START), which expired last December. Czech policemen stand guard backdropped by Prague’s castle on April 7, 2010. Russian President Dmitry Medvedev landed in Prague Wednesday evening to sign a landmark nuclear disarmament treaty with US President Barack Obama the following day, a Prague airport spokeswoman said. The two heads of state will sign a successor to the 1991 Strategic Arms Reduction Treaty (START), which expired last December, in the city where Obama called for a nuclear-free world in a keynote speech a year ago. Swans swim by a fisherman early April 7, 2010 on the Vltava river in Prague. The sun rises over the city of Prague and its castle (background R) on April 7, 2010. The US and Russian presidents will meet in Prague on Paril 8, 2010 to sign a landmark nuclear disarmament treaty a year after the Barack Obama called for a nuclear-free world in the historic Czech capital. After months of difficult negotiations between the two nuclear powers, Obama and Dmitry Medvedev are due to sign a successor to the 1991 Strategic Arms Reduction Treaty (START), which expired last December. Tourists enjoy a view from the Prague Castle in Prague April 6, 2010. U.S. President Barack Obama and Russian President Dmitry Medvedev sealed an agreement on Friday on a landmark nuclear arms reduction treaty and will meet to sign it on April 8 at the Prague Castle in Prague, the White House said. Policemen guard the final preparations for the nuclear arms reduction treaty ratification in front of the Prague Castle on Wednesday, April 7, 2010. The newly completed “New START” treaty reducing long-range nuclear weapons is to be signed by US President Barrack Obama and Russian President Dmitry Medvedev in Prague on Thursday. Infant Jesus of Prague (Czech Pražské Jezulátko) is a famous statue of infant Jesus located in the Church of Our Lady Victorious in Malá Strana, Prague. 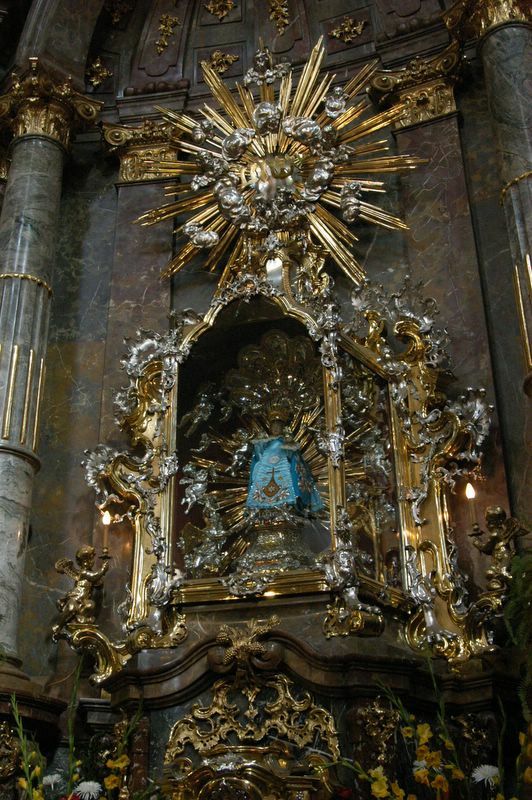 Its earliest history can be traced back to the year 1628 when a small, 48 centimeters in height, exquisite statue of wax Infant Jesus was brought into Bohemia by Polyxena von Lobkowitz, who became greatly attached to the Carmelites. This princess had been given the statue as a wedding gift by her mother, Maria Manriquez de Lara of Spain, and the statue was given to the Discalced Carmelites in Prague. Upon presenting it, the pious princess uttered a prophetic statement to the religious: “Venerable Fathers, I bring you my dearest possession. Honor this image and you shall never want”. The statue was set upon the oratory of the monastery of Our Lady of Victory, Prague, where special devotions to Jesus were offered before it twice a day. The Carmelite novices voluntarily became poor and professed their poverty fervently during devotions in the presence of the Divine Infant.